From time to time we may ask ourselves, what is a short story? To be sure, length is a defining characteristic, but it is not enough. Can we trace certain recurring threads throughout the now expansive history of the form: a constant set of concerns, a type of character, a type of plot? The form is, to its credit, too nimble for such decrees; what Alice Munro does with a short story is dramatically distinct from what George Saunders does, and both use the form with exactness and brilliance. But perhaps we can observe, in general, that there are particular things the short story can do especially well: for example, it may be exceptionally well-suited to capturing a type of character at a critical moment of transformation. It is felicitous, then, when the form’s aptitudes meet squarely with an author’s material and intent, as in Middle Men (Simon & Schuster, 224 pages) by Jim Gavin. Frank O’Connor famously observed that, in lieu of a hero, the short story more often concerns itself with submerged population groups, a term he acknowledged as awkward, but one that served his purpose: “That submerged population changes its character from writer to writer, from generation to generation. It may be Gogol’s officials, Turgenev’s serfs, Maupassant’s prostitutes, Chekhov’s doctors and teachers, Sherwood Anderson’s provincials, always dreaming of escape.” Jim Gavin’s first story collection is populated with his brand of such outsiders: dreamy young men, intelligent but lacking exceptional talent in their chosen fields or, sometimes, missing the cunning wherewithal to capitalize on the assets they do have. Gavin frames his stories as his characters reach a breaking point while seeking their way in an unforgiving contemporary landscape of corporate sales, Hollywood apprenticeships, tenuous relationships, and irksome and impermanent living arrangements. The American male is in some trouble in Middle Men. But Gavin steadily navigates the potential pitfalls of a collection concerning, almost exclusively, young (presumably white) men hopelessly adrift in their own lives. The acute sense of entitlement plaguing many of Gavin’s central characters is almost pitifully vague and naïve—there’s little trace of arrogance in it. In Part One of the title story, Matt cares for his cancer-stricken mother with genuine love and dutifulness, but also with a sense of relief that, for once, he knows exactly what is expected of him—only to be cut adrift again after her death: “After she died, Matt, for his pain and loss, felt entitled to many rewards. He secretly anticipated, in no particular order, a moment of spiritual transcendence, the touch of a beautiful and understanding woman, and some kind of financial windfall. Instead, at thirty, he was broke and living at home.” The expectation of a windfall or a “bonanza”—usually in the form of large-scale recognition of their talent and worthiness—is shared among these central characters, yet underlying this expectation runs a current of profound existential anxiety. But perhaps most significant of all is the increasingly difficult terrain confronting these young men. Literature has long been interested in the spacious no-man’s land between youthful dreams and the exigencies of reality as an adult, a fraught terrain well populated with winsomely idealistic characters who cannot quite bring themselves to conform. But for the generation known as “Millennials,” the path from adolescence to independence seems more hazardous and the future more murky than ever. For the characters of Middle Men, jobs are hard to come by and, when available, offer little hope for upward mobility. Work appears unlikely to blossom into the satisfactions of vocation—satisfactions they’ve been primed to expect. And while they often fall back on family, there’s a profound sense that there is little help available to them, and certainly no safety net. As Gavin’s characters grapple with the loss of a dream of greatness, a larger sadness takes shape on the page: even modest aspirations of middle class stability may be out of reach. Gavin’s characters are torn between an inborn work ethic and a desire to revel in the freedom of giving up and giving in. Their tortured struggles for success feel distinctly American, and distinctly of their age. His vision of contemporary California—both panoramic and exquisitely detailed—rings true, too. It’s a landscape of sprawling freeways and Del Taco; a place where the promise of American dreams shines especially brightly—perhaps because it is a mirage. Yet amid the disillusionment, California offers its familiar comforts: the beauty of the landscape, the solace and freedom of anonymity in a town of celebrities, the culinary consolations of Del Taco. Sad and funny but never twee, Middle Men captures its mishap-prone and chronically underemployed characters on the cusp of moving beyond their muddled dreams of grandeur. Gavin renders the moment they are forced to let go of a lifeline and are propelled beyond one stage of life into an as-yet-unknown other. And by investing their lives with layers of loss, comedy, and meaning, he has created both distinct individuals as well as a somber reflection of their time and place—a landscape of starkly diminished opportunity. 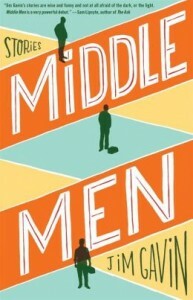 This entry was posted in Book Reviews and tagged collection, Jim Gavin, Middle Men, Simon & Schuster, story. Bookmark the permalink.